Did You Buy A Brita Pitcher? Forget About The Rebate - Brita Says! You are here: Home / Great Deals / Did You Buy A Brita Pitcher? Forget About The Rebate – Brita Says! Did You Buy A Brita Pitcher? Forget About The Rebate – Brita Says! Brita Changed Their Minds, Again! If you bought the Brita Pitcher that we found such great deals on with their rebate, it looks like it’s a no go! 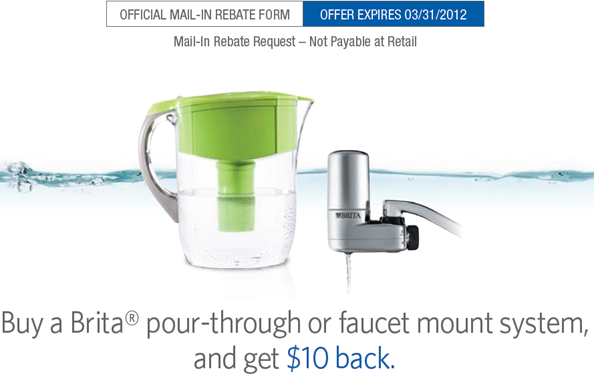 Brita announced on their Facebook page they won’t be honoring the rebate – unless it’s in the mail already. Brita FilterForGood Hi Nomiki – this is Andrea from Brita. Unfortunately we are no longer able to honor the rebates because all rebate supplies have been exhausted. We will be honoring any rebates that were already mailed in. I apologize for the inconvenience! If you would like to make a formal complaint, please visit our website at http://www.brita.com/contact/. You can voice your concerns on their Facebook page or thru the website listed above. You can also return any pitchers you bought. Other than that I don’t know what we can do. My friend Sara, over at Saving For Someday has written a great post with even more info on what you can do! That is such utter bs……what the heck, you mean if I didn’t get mine in the mail, I don’t get a rebate? So not cool! That is fraud, unless there was fine print no one read on the rebate form. Becky: I am sorry to hear that! Where does it say they don’t honor it anymore?? I saw your post, but where does it say on facebook that they are not doing rebate anymore? I got my $10, but it took about 3 months! They had to be losing money on it because at the time I did it I think there was a $4 or $5 coupon that you could use and Wal-mart had them super cheap. It was a big money maker for consumers. Karen B » Yeah, it the same now, too. Not sure what their thinking was. Do you think I could return my pitcher with a copy of my receipt?I always maka copy when I send in a rebate form. Ellie » I have never tried that – but, it couldn’t hurt to try! Wow have you guys seen there wall..ppl are really upset!!! I’m assuming this is a new deal because I bought one quite a while back and received my rebate last week. That stinks that people aren’t getting their rebates. Brita will be honoring these. Here is the post…Hi Brita fans! Great news to report: We will be honoring all the mail-in rebates that were recently available! We apologize for all the inconvenience this caused. Thanks for you patience and sticking with Brita. Enjoy your rebates! This is the reason why I don’t do rebates. I never know if they are going to be honored. I only do rebates if they are given up front at purchase.